Badal Mahal is the highest point in the Kumbhalgarh Fort. Famously known as the 'Palace of Clouds'. 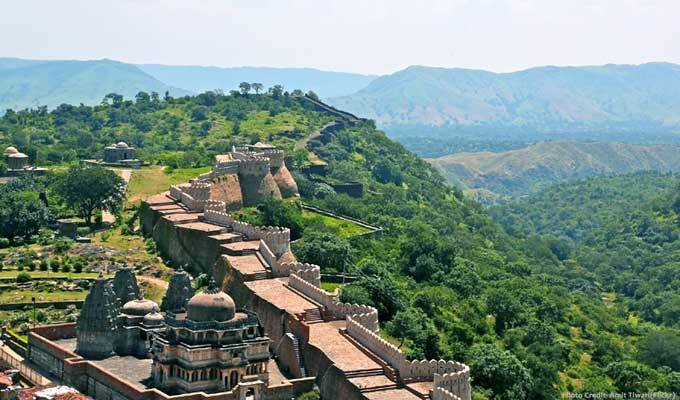 It is located at the top of the Kumbhalgarh Fort. Badal Mahal is a two storey palace. The whole building of the palace is parted into two interconnected mahals called the Mardana Mahal and the Zanana Mahal.Badal Mahal has the well-painted rooms which are painted with pastel-coloured murals, representing the period of the 19th century. Place rooms have turquoise, green and white colour schemes on its wall. There are stone jalis in the Zanana Mahal through which queens used to watch ; these jalis were used to see the court proceedings and other main events. These chambers have the creative air conditioning system which is an interesting thing to notice. The system is facilitated with a series of duct pipes which allows cool air into the beautiful rooms, further ventilating them from the bottom. By Road: Badal Mahal is located in the Rajsamand District in the Kumbhalgarh and 100 km from Udaipur. One can easily reach here by bus or taxi. By Rail: Badal Mahal is well connected through nearest Falna and Rani Railway station to major cities railway stations like Delhi, Agra, Mumbai, Chennai, Bikaner, Jodhpur, Jaipur, Ahmedabad. By Air: Badal Mahal can be reach through nearest Udaipur Airport which is well connected with regular domestic flights to Delhi, Kolkata, Mumbai, Ahmedabad, Jodhpur and Jaipur.